This application can only play contents but send screen as issuchas HDMI, MHL, Miracast and Chromecast. this app will helps to find share your mobile/Tablet devicescreento suitable/ compatible miracast/Wireless display device suchasSmart TV or Wireless display dongles/adopters. This app works(Tested) on most of the mobile phones withAndroidversion 4.2 and above. It does not need dongle or extra cable. Click "Start," theMobilehotspot will automatically run. And after the hotspot is upandrunning, connect to the AP from other devices. 1 >>> ennable Wireless Display or any sort ofDisplayDongles. Are you looking for free Wi-Fi? Now, cracktheWiFi password from any network around you with a fasterWi-Fipassword cracker application. Confirm the password for anysecurewireless (WiFi) network connection.Crack WiFi passwords from your wireless network friends andshowthem that you master piracy. Show yourself a guru by crackingverysecret and hidden passwords with the cracker WiFipasswordapplication.You have a spirit of technical genius! WiFi Steel Password foryouruniversity lab, school laboratory, office and friends. Aprefectjoke to play on friends and family!Start the application and search all available lists ofWi-Finetworks. Select the WiFi account you want to hack into and afakepassword will be generated for it! . They think you simplyhackedtheir WiFi account!Disclaimer - WiFi Cracker Prank is just a joke application. Thisisnot a true application of piracy. These are not real steelWiFipasswords. All generated passwords are random and false! Screen Mirroring App will assist you toscanand mirror your android phone or tab's screen on smartTV/Display(mira cast enabled ) or Wireless dongles oradapters.Screen Mirroring Able to play videos, music, photos, etc inmysmartphone with any devices (smartphone, smartTV, laptop,tablet,etc) at anywhere.Miracast Screen Finder does not need extra dongle or cable.Clickthe application “Start WIFI”, the Mobile hotspot will beoperatingautomatically. and After hotspot will be operating,connect to APfrom other devices.Screen Mirroring can only play contents but send screen as issuchas HDMI, MHL, Miracast and Chromecast. User can share withfriendsand also there is help instructions.Please follow below steps to mirror your mobile screen tosmartTV.1) Your Smart TV should support Wireless Display or any sortofDisplay Dongles.2) The TV must be connected to wifi network same asyourphone.3) The Phone version must be android 4.0 and above.4) Download and run Miracast Screen Finder. 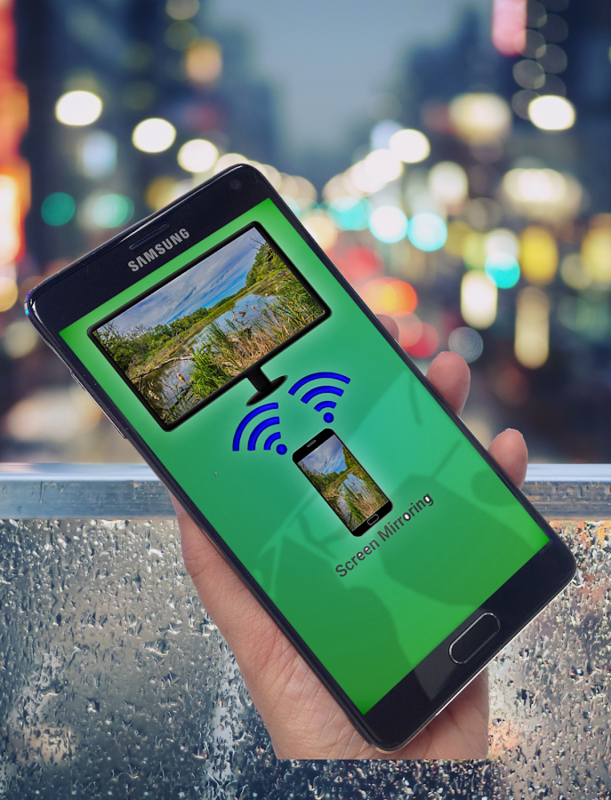 DLNA Media Streaming and Mirroring allows you to Stream your localMedia content such as HD Videos, Audio files and Images on to DLNAenabled Smart TVs. This App also gives option to user share ormirror their mobile screen on to Miracast enabled wireless displayor smart TV or to Miracast dongles.For DLNA please make sure bothWiFi Display device or Smart TV and Mobile phones are connected tosame network.For Miracast based Screen mirroring please make sureThat your TV or Wireless Display device is enabled with MiracastTechnology.This has been tested with major mobile phonemanufacturers such as Samsung, LG, Honor Huawei, HTC, ViVO,Oppo,Xiaomi Mi phones and many other brands.Please share your feed backto [email protected] if this app is not working on yourphone. Screen MirroringAble to play videos, music, photos, etc in my smartphone with anydevices (smartphone, smartTV, laptop, tablet, etc) atanywhere.This application can only play contents but send screen as is suchas HDMI, MHL, Miracast and Chromecast.it does not need extra dongle or cable. Click the “Start”, theMobile hotspot will be operating automatically. and After hotspotwill be operating, connect to AP from other devices.From now on, play video, music and photo in real time withoutcopying it!! * The app also allows for banner ads at the bottom of thescreen.Ever wish you had an extra display for your Windows computer?There's an app for that.With Air Duet Screen, you can use your Android screen as a wirelessdisplay to extend your computer desktop.In order for Air Duet Screen to work, your computer and Androiddevice must be connected to the same Wi-Fi network.Like a wireless display, Air Duet Screen works in two ways:(1) Extend your computer screen onto a second screen, or(2) Move the special app onto your Android screen. * It will more fast and smooth on windows 8 because we were usedbest algorithm Desktop Duplication Interface. * Prepare environment is very simple.Introduce:Air Duet Screen's performance is extremely responsive, employing aunique dynamic compression algorithm.On a typical Wi-Fi network, mouse cursor refreshes areindistinguishable from a wired mouse.Air Duet Screen makes a laptop much more useful by increasing itsusable screen size.Air Duet Screen not only gives you a wireless computer screenextender, but also works as a tablet input device.You can use your finger to draw directly on the screen's surface.Try it with a calculator, painting tool, or music controlsurface.Simple gestures allow you to operate the right mouse button andscroll wheel. When you rotate the screen, or disconnect andreconnect.Your windows are automatically repositioned appropriately, so youdon't have to drag them back to the Android screen.Some great uses for Air Screen include:- Fill your Duet Screen with your utility apps such as mail,filemanager, and Calculator.- Graphic design: Make Photoshop and Illustrator usable on yourlaptop by putting your tool palettes on the Android screen.- Programming: Use the extra display area for such auxiliarydevelopment tools as Console, Terminal, and the Debugger.- Business: Move all of your Office palettes and inspector windowsonto Air Screen, and let your document fill the screen.On first launch, Air Screen presents easy instructions fordownloading and installing the free companion support software foryour desktop computer.Both devices must be on the same Wi-Fi network.Screen Mirroring App will assist you to scan and mirror yourandroid phone or tab's screen on smart TV/Display (mira castenabled ) or Wireless dongles or adapters.This app has been tested and found works on most of android mobileswith android version 4.2 and above.to mirror your mobile screen to smart TV .. Please follow belowsteps :- Your TV should support Wireless Display or any sort of DisplayDongles.- The TV must be connected to wifi network same as yourphone.- The Phone version must be android 4.2 and above.- Download and run Screen Mirroring Assistant App. Screen Stream Mirroring Pro App will assist you to scan and mirroryour android phone or tab's screen on smart TV/Display (mira castenabled ) or Wireless dongles or adapters.This app has been testedand found works on most of android mobiles with android version 4.2and above.Please follow below steps to mirror your mobile screen tosmart TV.Screen Stream Mirroring Pro is a powerful application formirroring and broadcasting the screen and audio of your device!Youcan share your Android screen live to any other device or PC onyour local network, via a media player, web browser, Chromecast, orUPnP compatible devices / DLNA (many Smart TVs or other devices). *Your TV should support Wireless Display or any sort of DisplayDongles. * The TV must be connected to wifi network same as yourphone. * The Phone version must be android 4.2 and above. * Downloadand run Screen Mirroring Assistant App. Screen Mirroring App will assist you to scan and mirror yourandroid phone or tab's screen on smart TV/Display (mira castenabled ) or Wireless dongles or adapters.Screen Mirroring Able toplay videos, music, photos, etc in my smartphone with any devices(smartphone, smartTV, laptop, tablet, etc) at anywhere.Mirrorscreen does not need extra dongle or cable. Click the “Start”, theMobile hotspot will be operating automatically. and After hotspotwill be operating, connect to AP from other devices.ScreenMirroring can only play contents but send screen as is such asHDMI, MHL, Miracast and Chromecast. It has been tested and foundworks on most of android mobiles.Features:★ screen mirroring app★mirror screen★ screen mirroring samsung tv★ mirror tv★ screenmirroring samsung smart tv★ samsung screen mirroring★ mirror cast★screen mirroring Samsung★ cast screen android★ samsung mirroringapp★ screen mirr★ mirror screen android★ screen mirroring forsamsung tv★ mirroring to tv★ screen mirroring laptopPlease followbelow steps to mirror your mobile screen to smart TV.1) Your TVshould support Wireless Display or any sort of Display Dongles.2)The TV must be connected to wifi network same as your phone.3) ThePhone version must be android 4.2 and above.4) Download and runScreen Mirroring App. The application of special phone to make several things and hassize fits phone.As the application is free and easy to use.Thisapplication can play only the contents, but also sends the screenis like HDMI, MHL, Miracast and the Chromecast Program viewof the phone to the TV screen is important in your phone and hasmany features, includingwifi connect mobile phone to tv screenmirroring* Second screen mirroring Wifi* screen mirroring wificonnect* wifi display miracast free application* mirroring phone totv screen* screen mirroring phone to tv* wifi display free forandroid* screen stream mirroring* wireless display connect tv*screen mirroring to sony tv bravia led* screen mirroring to samsungled smart tv* screen mirroring for sony bravia tv miracast* screenmirroring for sony bravia tv app* wifi screen mirroring* screenmirroring app for android* stream screen mirroring* screenmirroring app for android to roku* screen mirroring app for androidto laptop* screen mirroring to tvfor android* wifi miracast free *display phone screen on tv free application for phone* wirelessdisplay free* second screen mirroring and display phone screen ontv freeWonderful application has good graphics wish to obtainsatisfaction .Thank you for review application . Easy to use, just choose your media andpressto play, one step to play it on your TV!At any time and anywhere, from any device - enjoy your friendsandfamily - with TV Assist on your phone, you can play yourfavoritephotos, videos and music as you like, Like a TV nearby.Momentswith everyone to see and hear!TV Assist can also browse the media on other DLNA devices andplaythem on your TV or other DLNA device!TV support can work as a multimedia receiver (rendering), itcanalso receive media played from other DLNA devices, forexample,another iPhone / iPad that works with TV Assist.Wifi Screen Flow MirrorAble to play videos, music, photos, etc. In my smartphone withanydevice (smartphone, smartTV, laptop, tablet, etc. ).This application can only play content but send the screen suchasHDMI, MHL, Miracast and Chromecast ! !It does not need any dongle or extra cable. Click "Start,"theMobile hotspot will run automatically. And after thehotspotbecomes operational, connect to the AP from otherdevices!!! 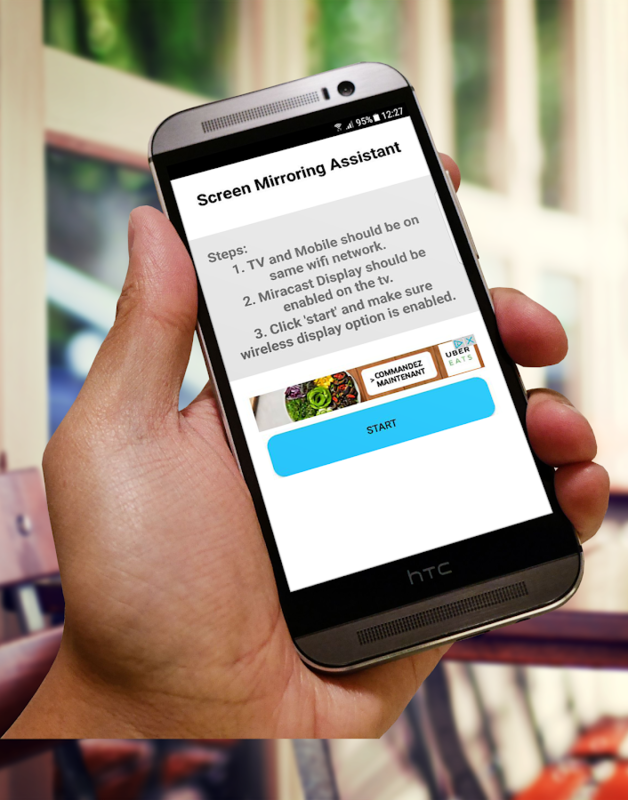 !The Screen Mirroring application will help you scan andmirroryourThe tab screen on Smart TV / Display (mira cast enabled) ordonglesor wireless adapters.This application has been tested and runs on most Androidmobileswith android version 4.2 and above !! !To mirror your mobile phone screen to smart TV.Please follow the 4 steps below !!!! * Your TV must support wireless display or any kind ofdisplaydongles. * The TV must be connected to a wifi network identical to thatofyour phone !!!!!! * Phone version must be Android 4.2 and higher. * Download and run the Screen Mirroring Assistantapplication. * Enjoy...In order for Air Duet Screen to work, your computer andAndroiddevice must be connected to the same Wi-Fi networkAs a wireless screen, Air Duet Screen works in two ways:(1) Expand your computer screen to a second screen, or(2) Move the special application to your Android screen. * It will be faster and smooth on Windows 8 because we havebeenusing better Desktop Duplication Interface algorithm. * Preparing the environment is very simple !!! !Present:The performance of Air Duet Screen is extremely reactive, usingaunique dynamic compression algorithm.On a typical Wi-Fi network, refreshments on the mouse cursor cannotbe distinguished from a wired mouse !! !Air Duet Screen makes a laptop much more useful by increasingitsusable screen size.Air Duet Screen not only gives you a wireless screen extender,butalso works as a tablet input device !!!!! !You can use your finger to draw directly on the surface ofthescreen. Try it with a calculator, a painting tool or amusiccontrol surface.Simple gestures allow you to use the right mouse button andthescroll wheel. When you rotate the screen, or log outandreconnect.Your windows are automatically repositioned appropriately, so youdonot have to return them to the Android screen !! !Some great uses for Air Screen include:- Fill your Duet screen with your utility applications such asmail,file manager and calculator. Easy to use, just choose your media andpressto play, one step to play it on your TV .!!! !At any time and anywhere, from any device - enjoy your friendsandfamily - with TV Assist on your phone, you can play yourfavoritephotos, videos and music as you like, A TV in the vicinity.Momentswith everyone to see and hear!! !Screen Mirroring App will assist you to scan and mirror yourandroidphone or tab's screen on smart TV/Display (mira castenabled ) orWireless dongles or adapters... =Screen Mirroring Able to play videos, music, photos, etc inmysmartphone with any devices (smartphone, smartTV, laptop,tablet,etc) at anywhere.Mirror screen does not need extra dongle or cable. Clickthe“Start”, the Mobile hotspot will be operating automatically.andAfter hotspot will be operating, connect to AP fromotherdevices.Screen Mirroring can only play contents but send screen as issuchas HDMI, MHL, Miracast and Chromecast. It has been tested andfoundworks on most of android mobiles !!!! !★★★★★★★★★★★ Features: ★★★★★★★★★★★★ screen mirroring app★ mirror screen★ screen mirroring samsung tv★ mirror tv★ screen mirroring samsung smart tv★ samsung screen mirroring★ mirror cast★ screen mirroring Samsung★ cast screen android★ samsung mirroring app★ screen mirr★ mirror screen android★ screen mirroring for samsung tv★ mirroring to tv★ screen mirroring laptopPlease follow below steps to mirror your mobile screen tosmartTV.1) Your TV should support Wireless Display or any sort ofDisplayDongles.2) The TV must be connected to wifi network same asyourphone.3) The Phone version must be android 4.2 and above.4) Download and run Screen Mirroring App.